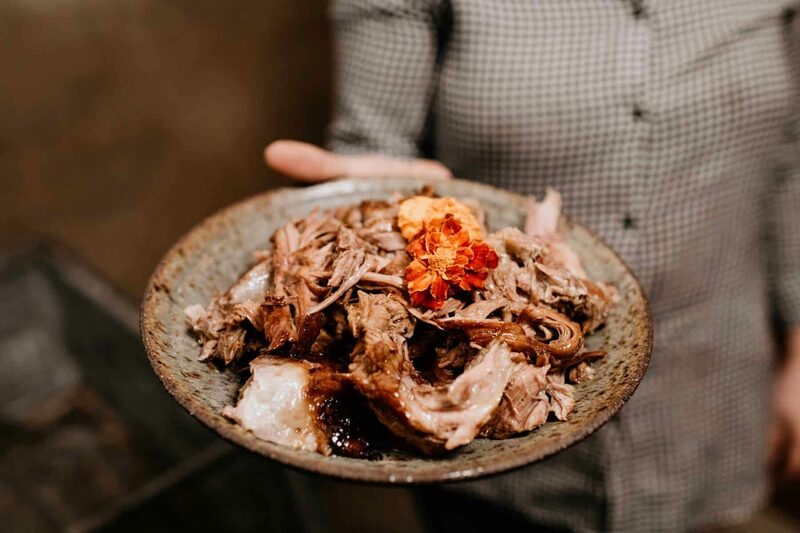 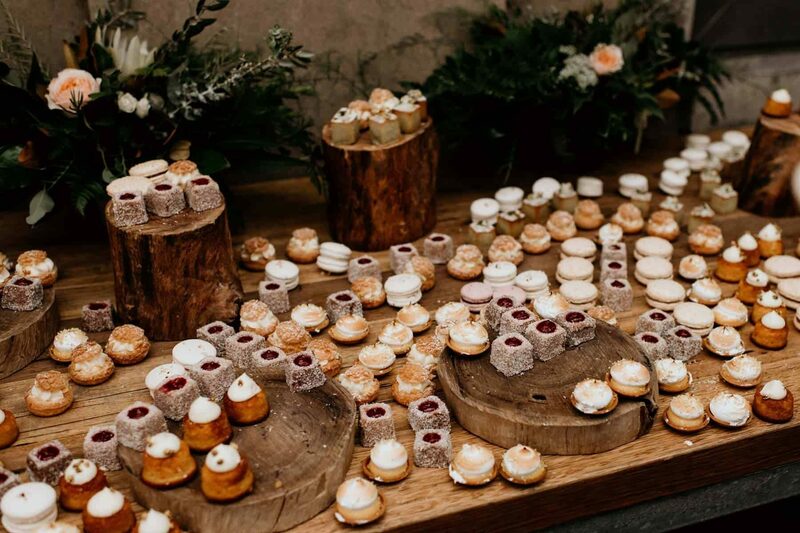 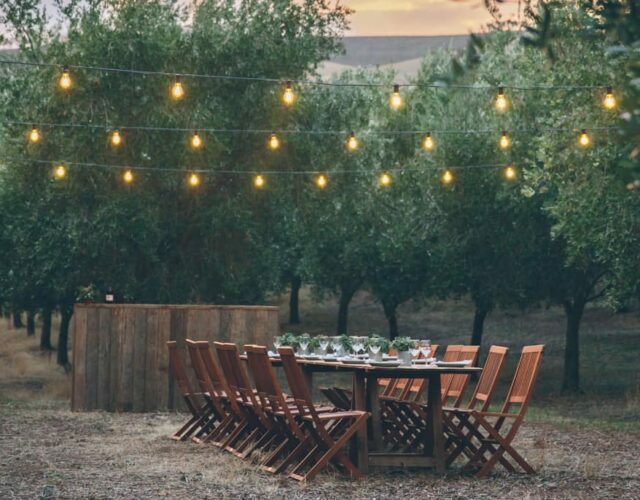 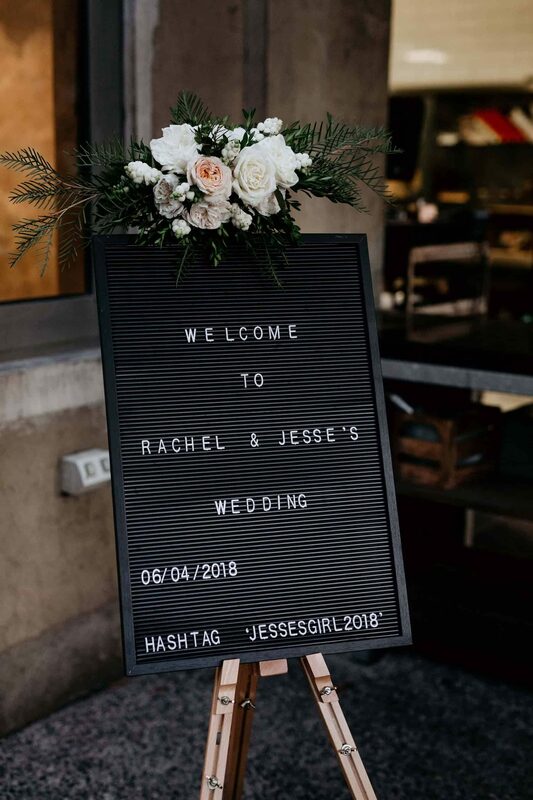 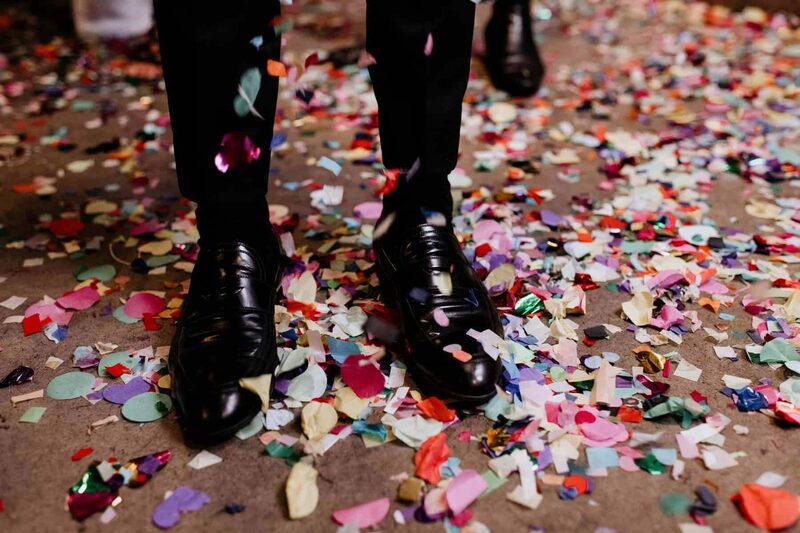 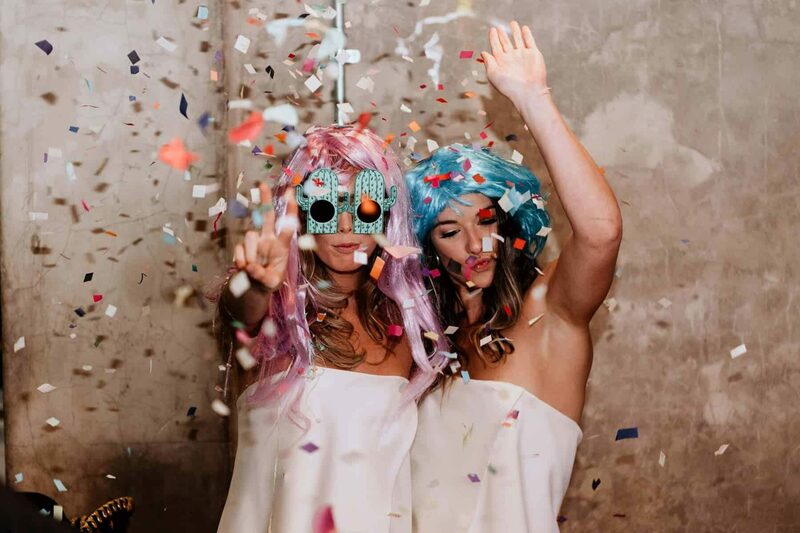 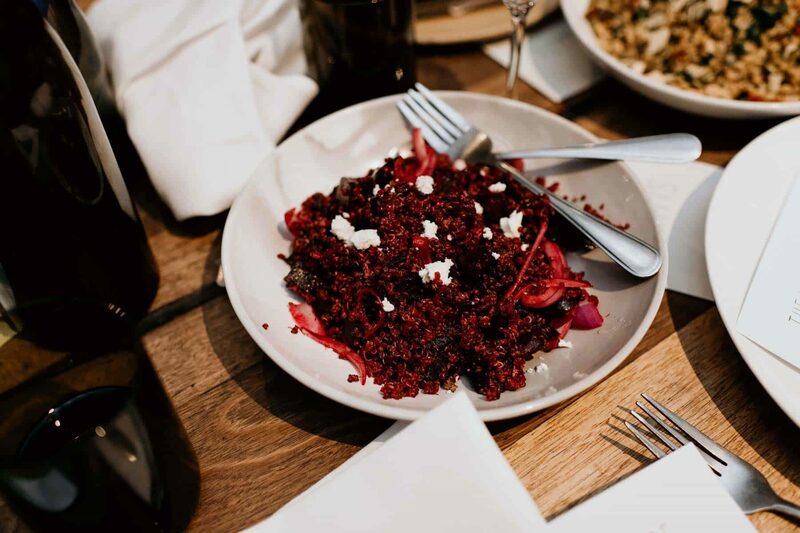 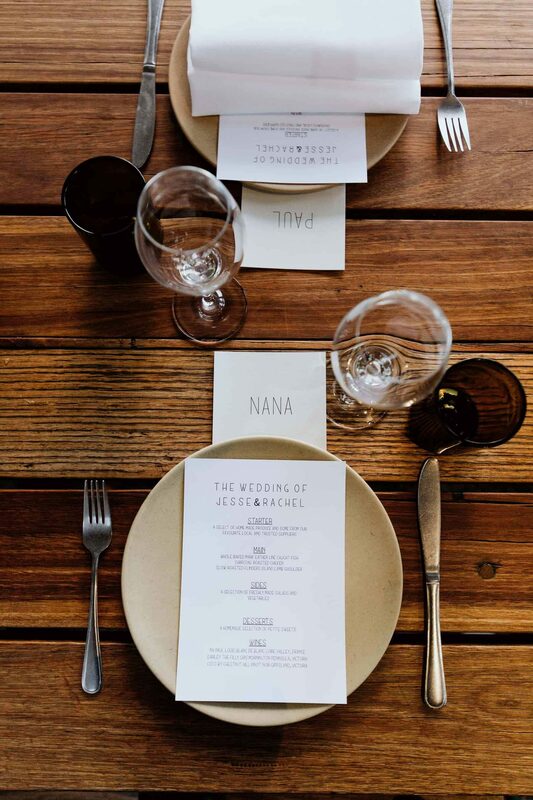 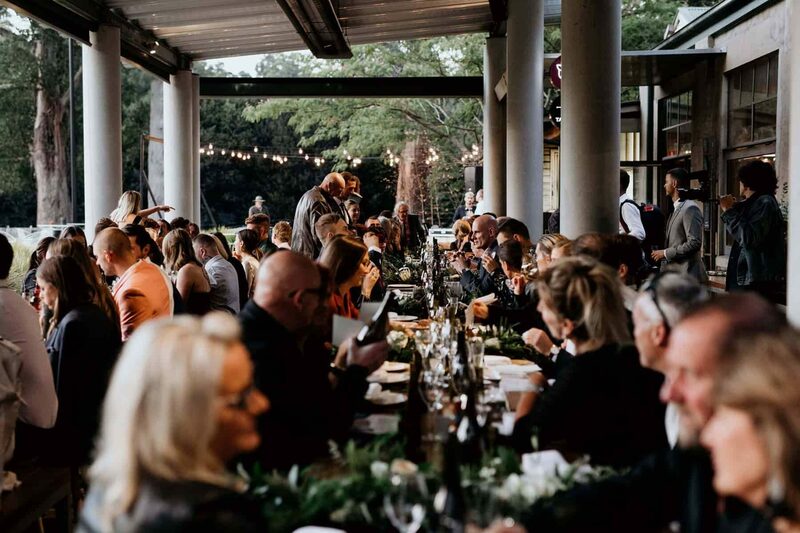 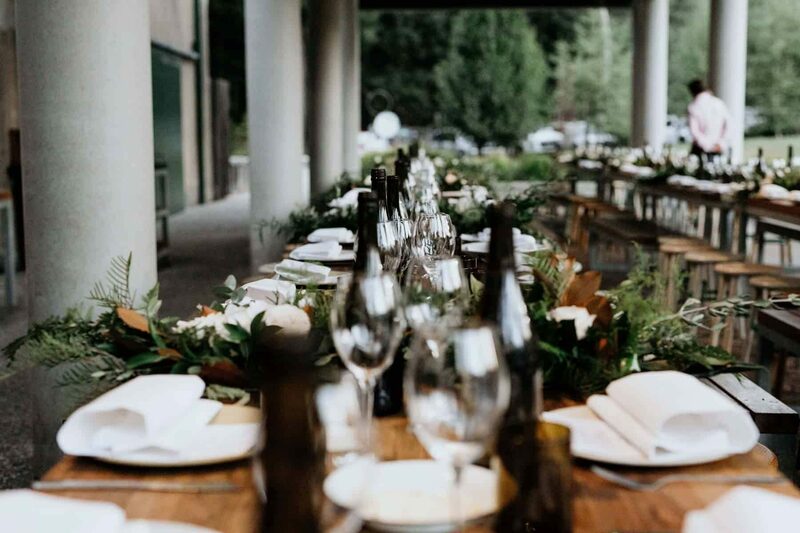 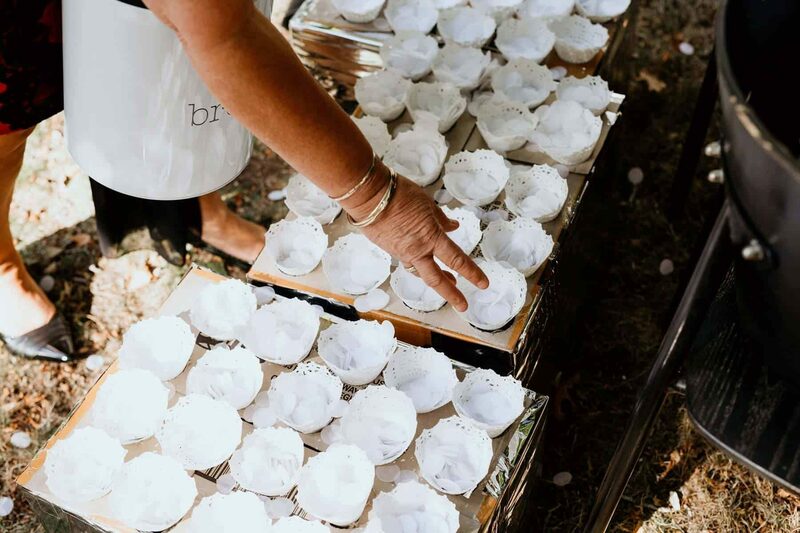 For Rach and Jesse, their wedding was all about the food, the wine and the dancing. 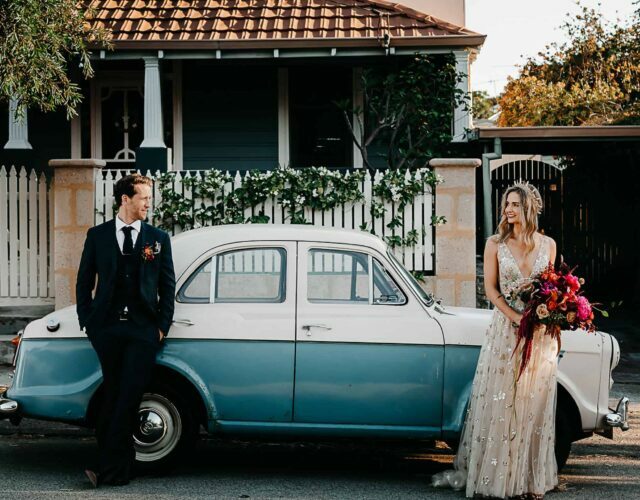 Their fave local brekkie spot, Piggery Cafe, ticked all their boxes with the added bonus that they can now pop back in whenever the mood strikes to relive those wedding feels! 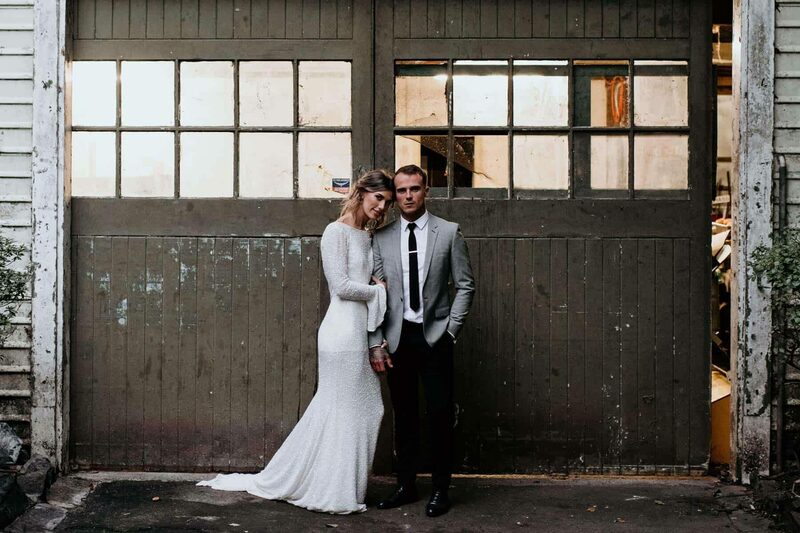 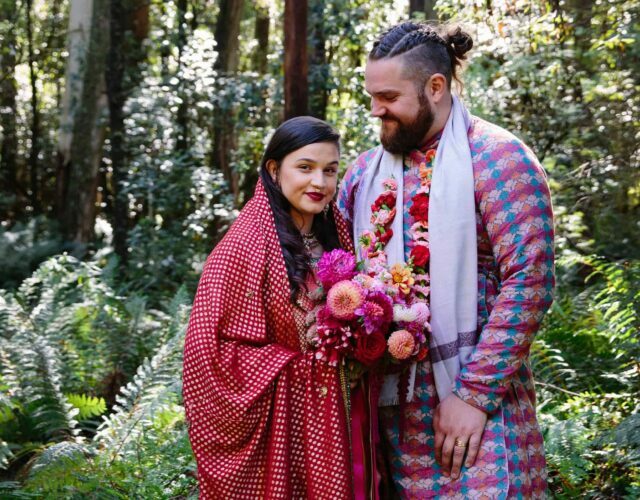 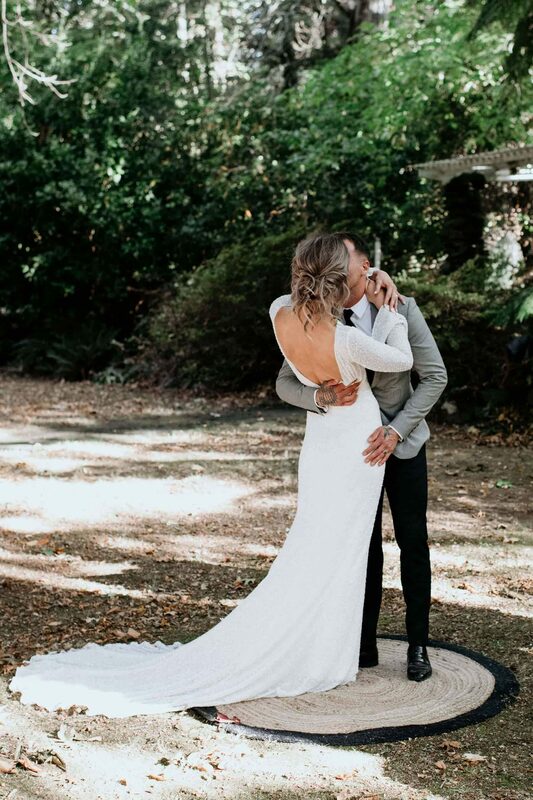 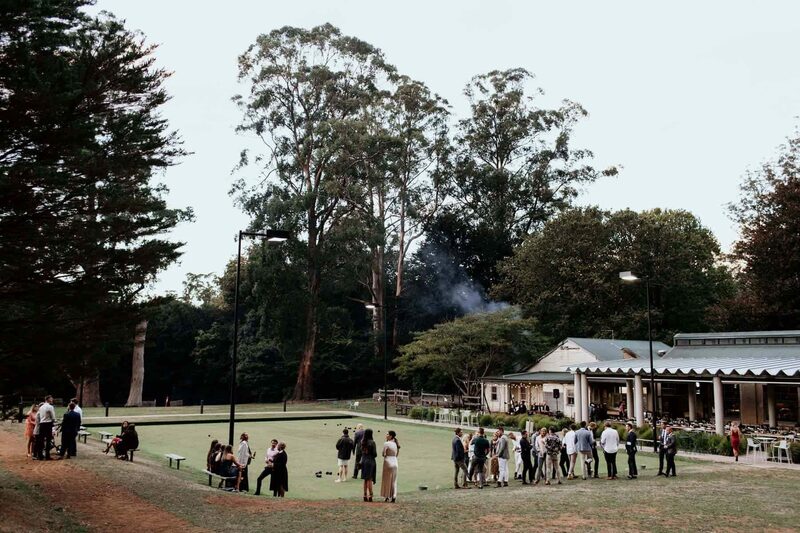 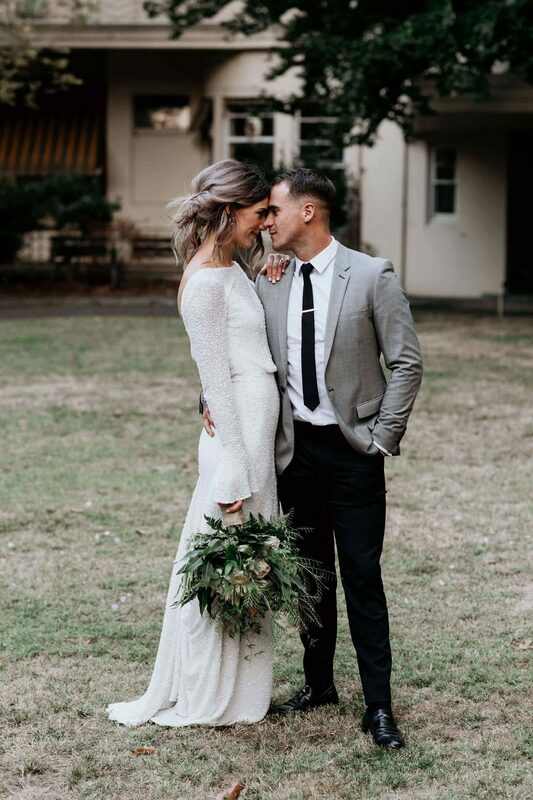 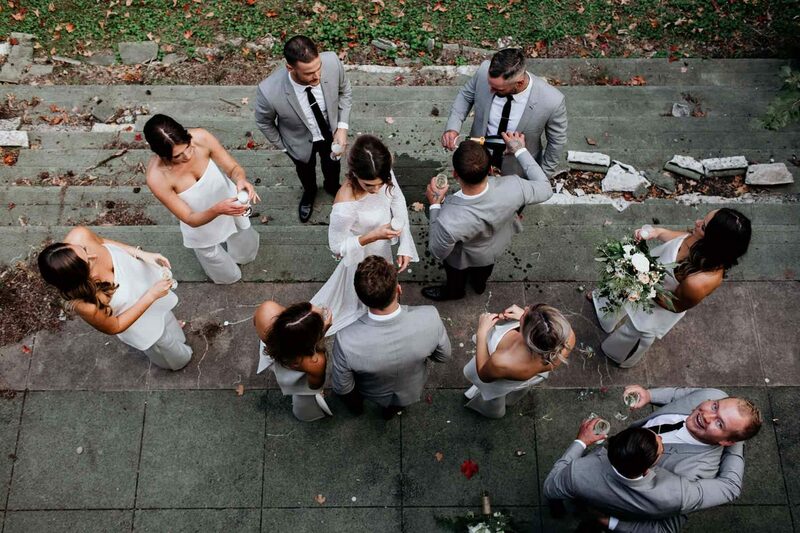 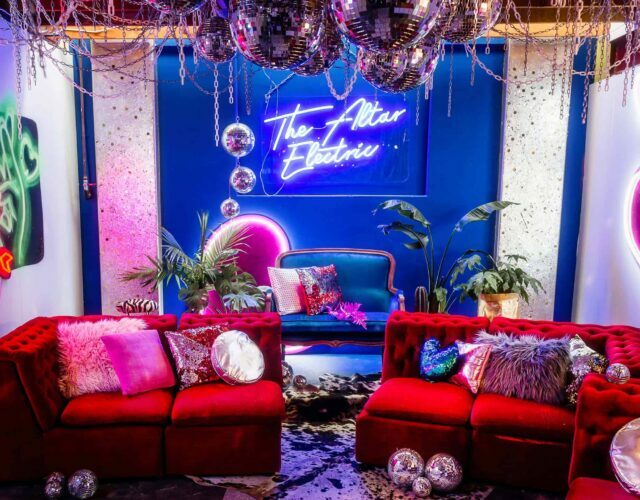 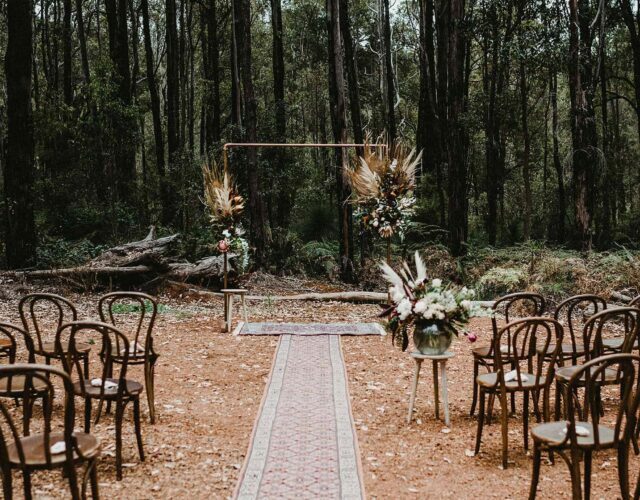 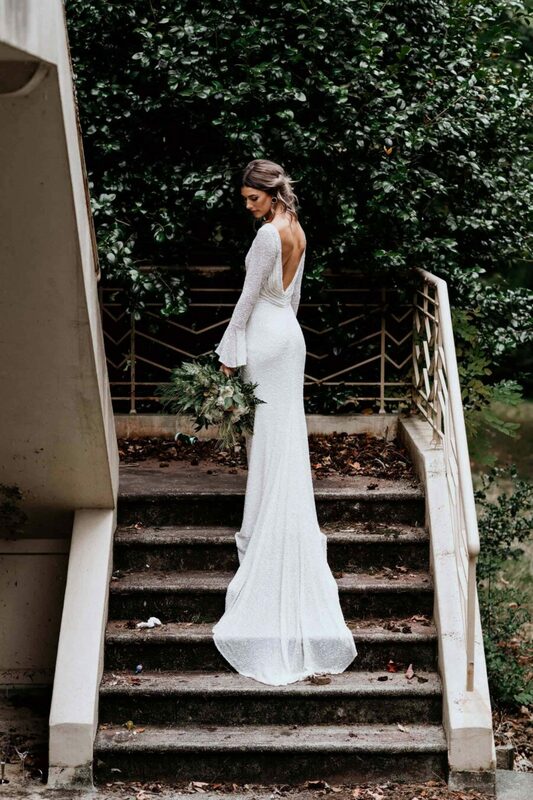 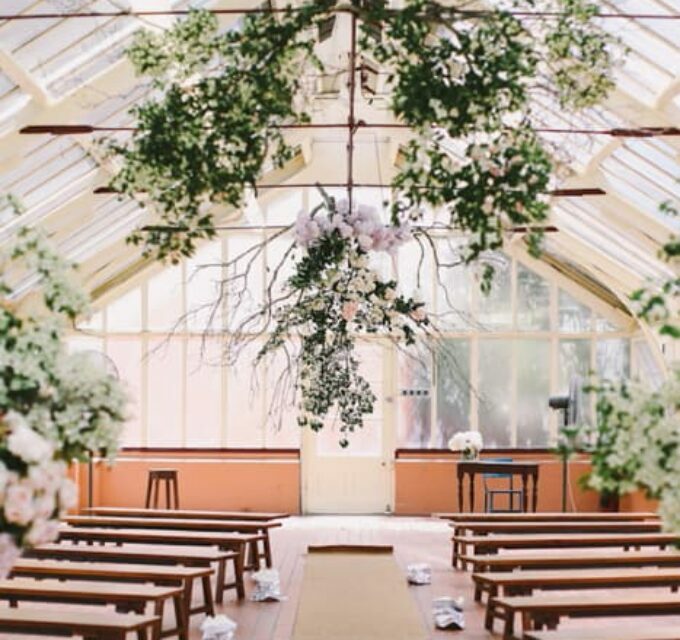 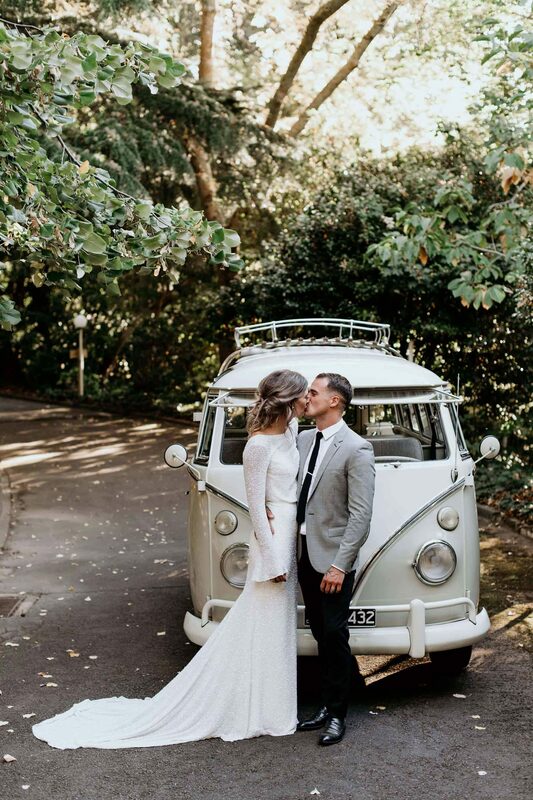 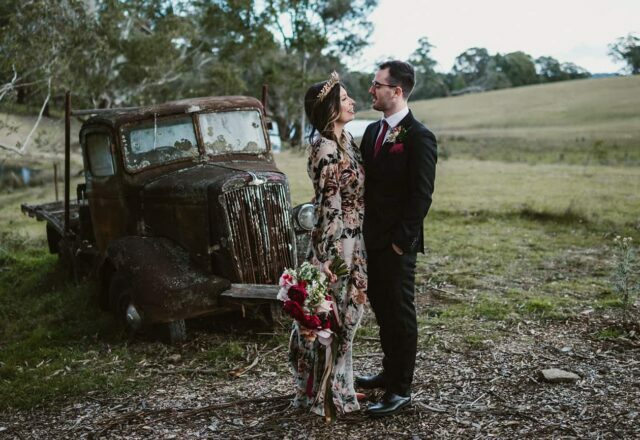 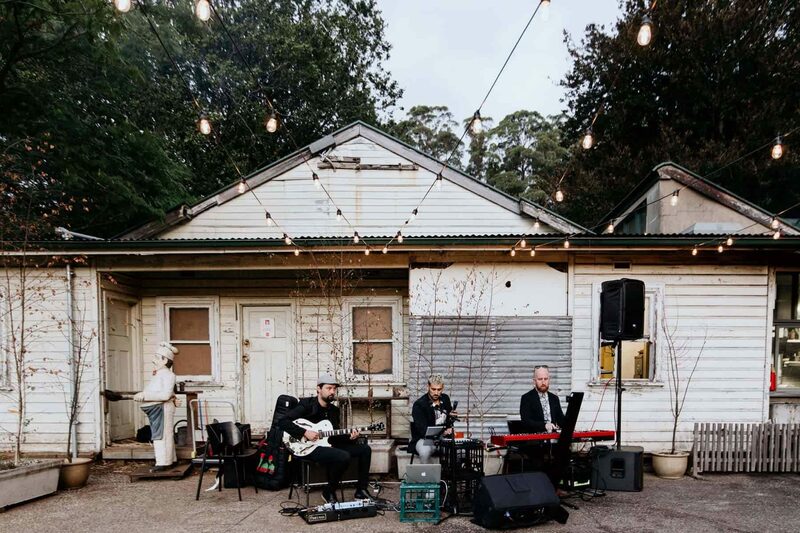 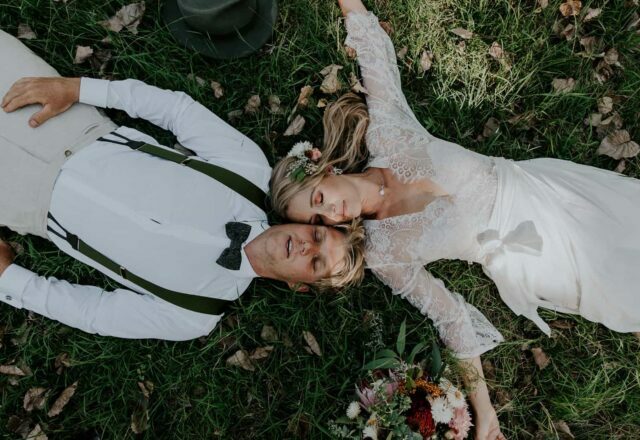 Nestled in the Dandenong Ranges, the Piggery’s sprawling gardens and industrial aesthetic were exactly what what Rach and Jesse were after, and the property’s abandoned art deco mansion made for some pretty dramatic photo ops with Daniel Chafer Photography and La Luce Films. 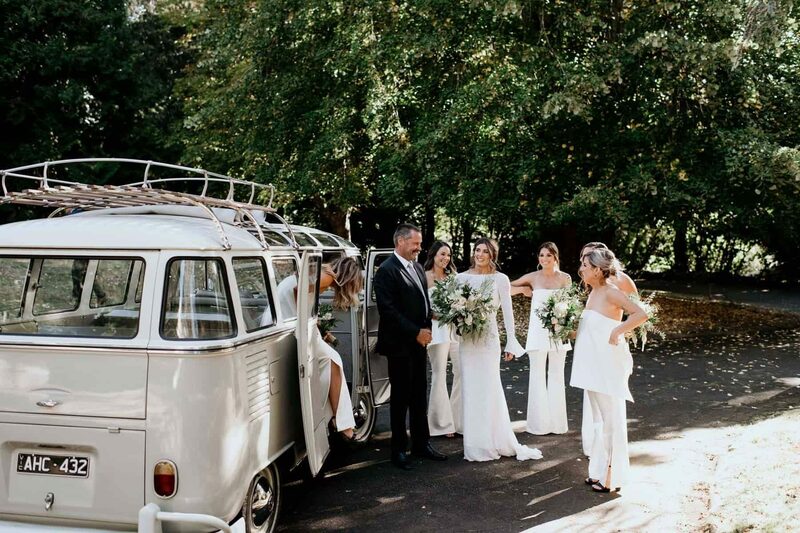 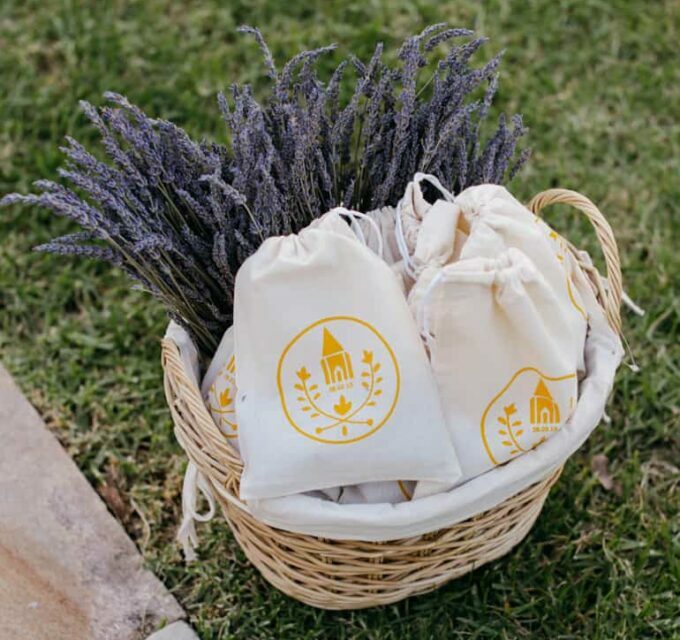 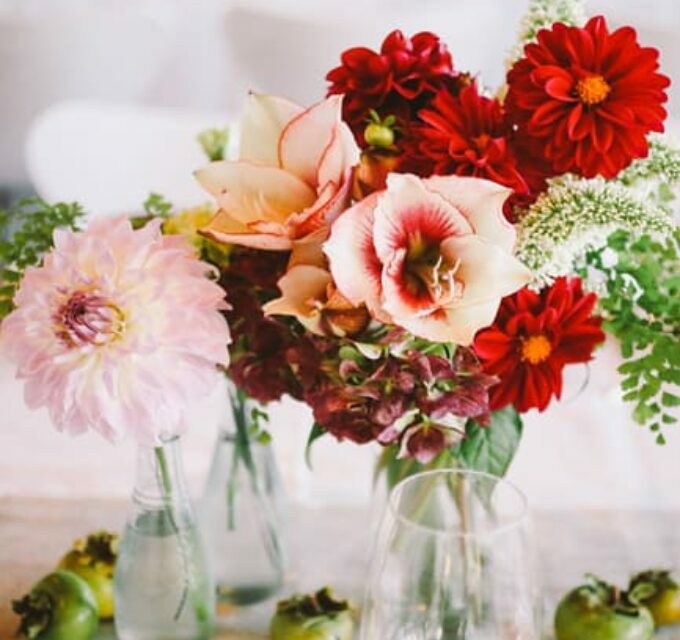 While the couple kept things pretty simple with styling, they went all out when it came to the bridal party. 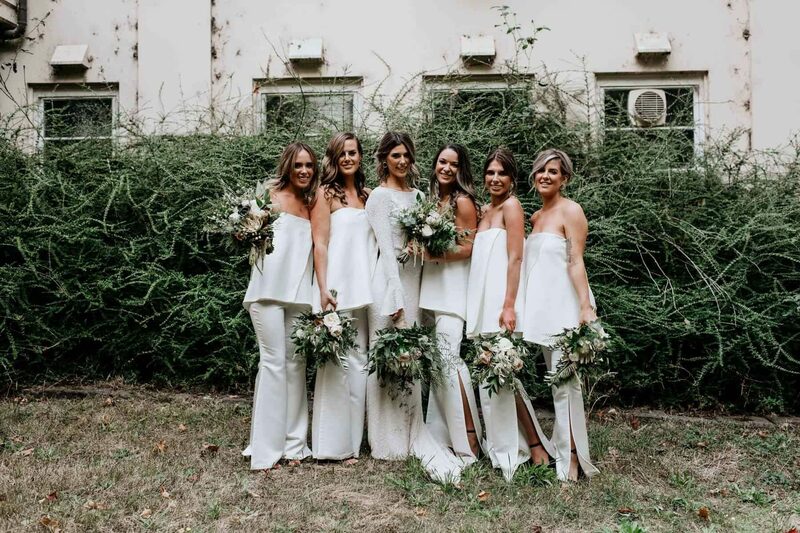 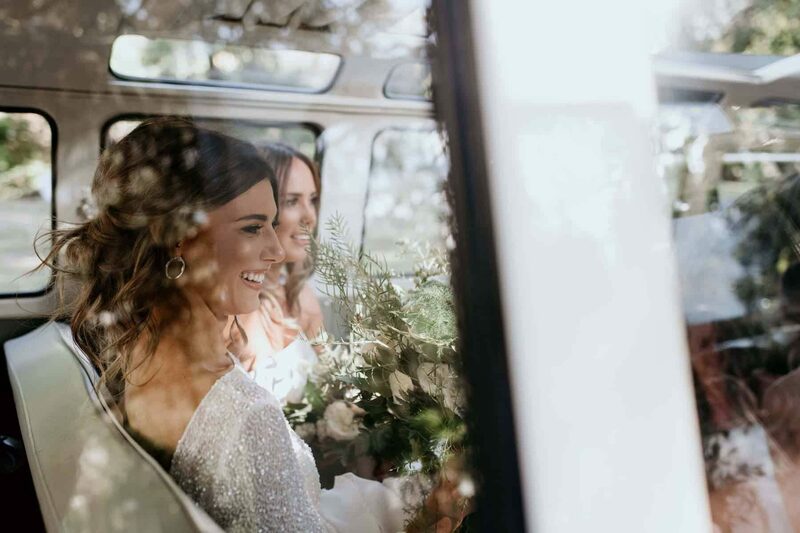 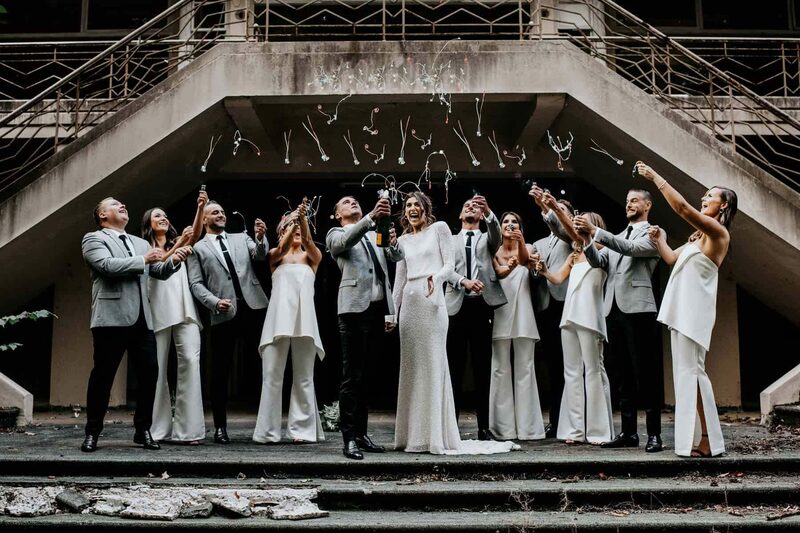 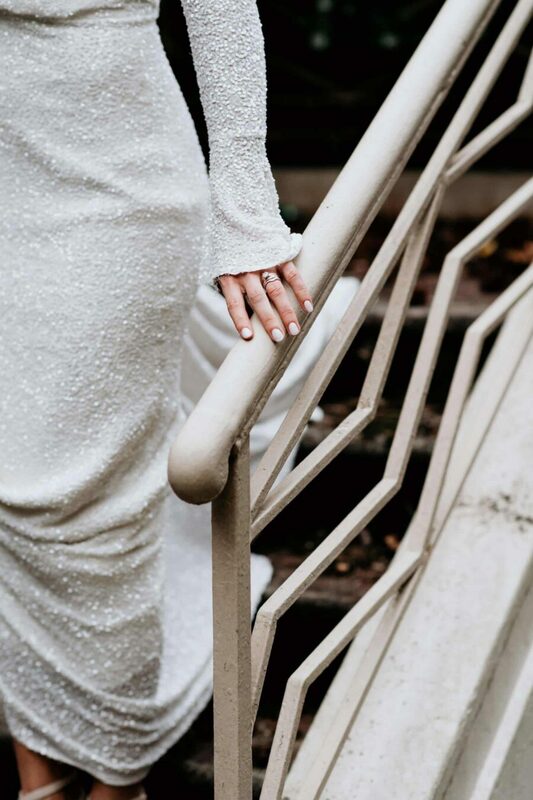 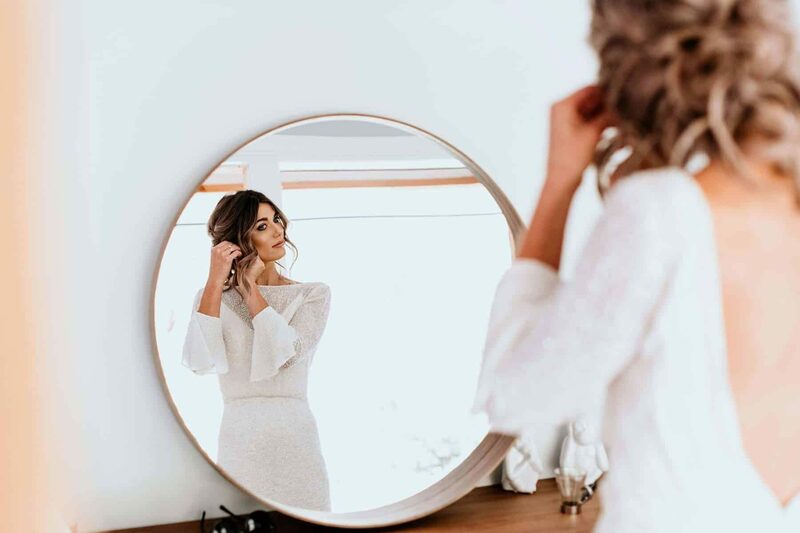 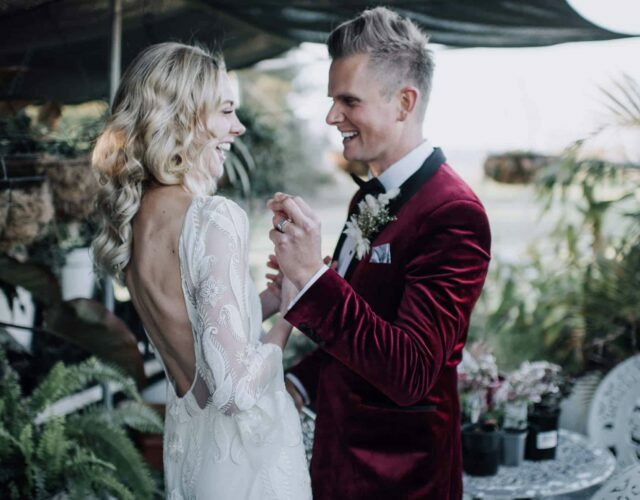 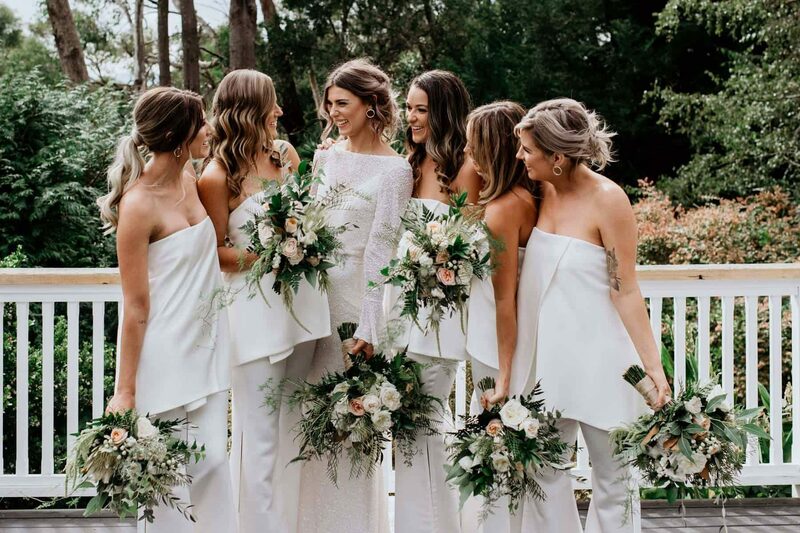 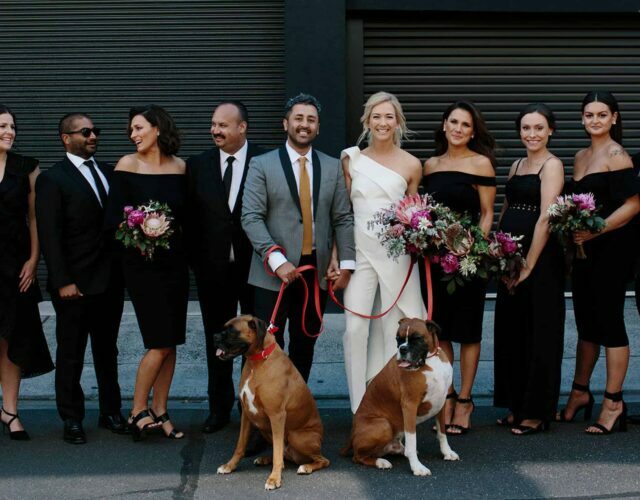 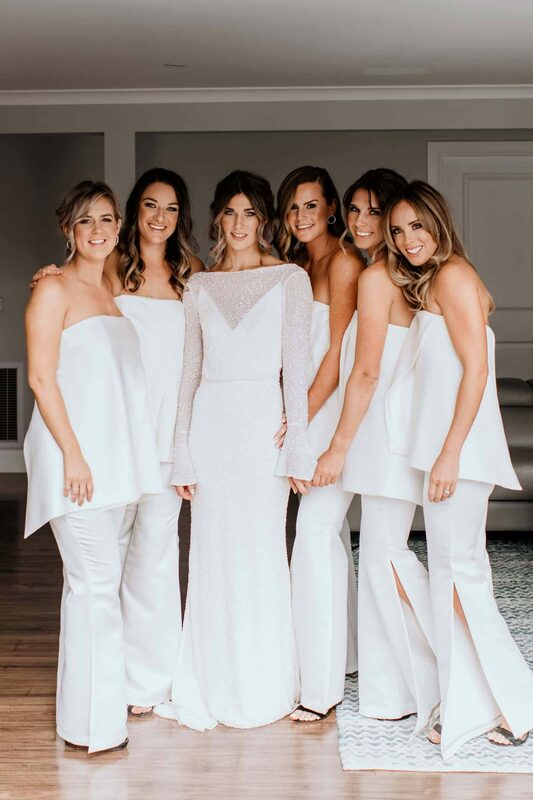 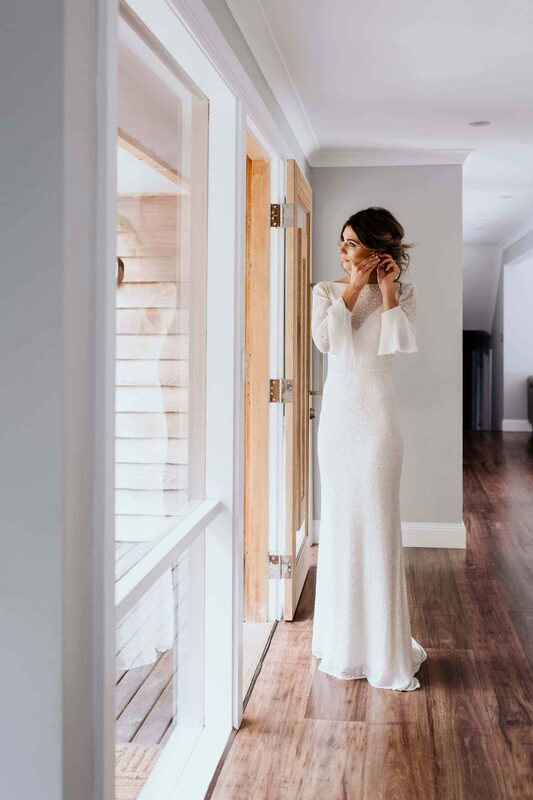 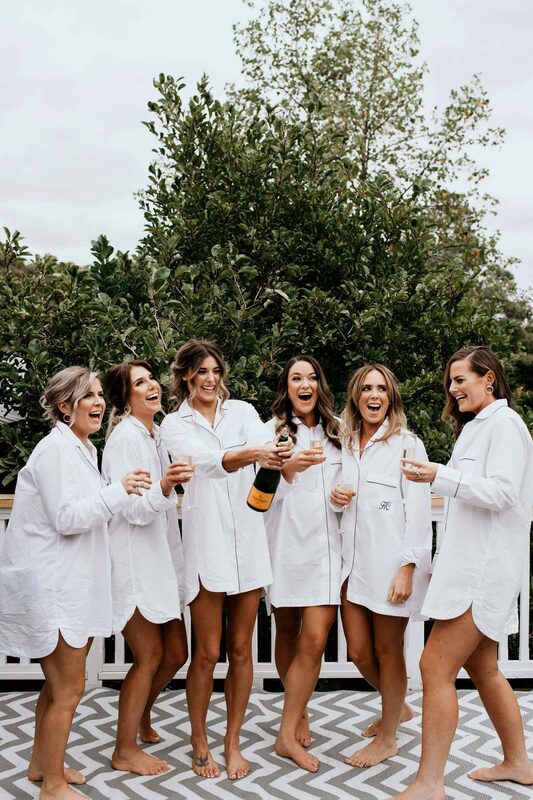 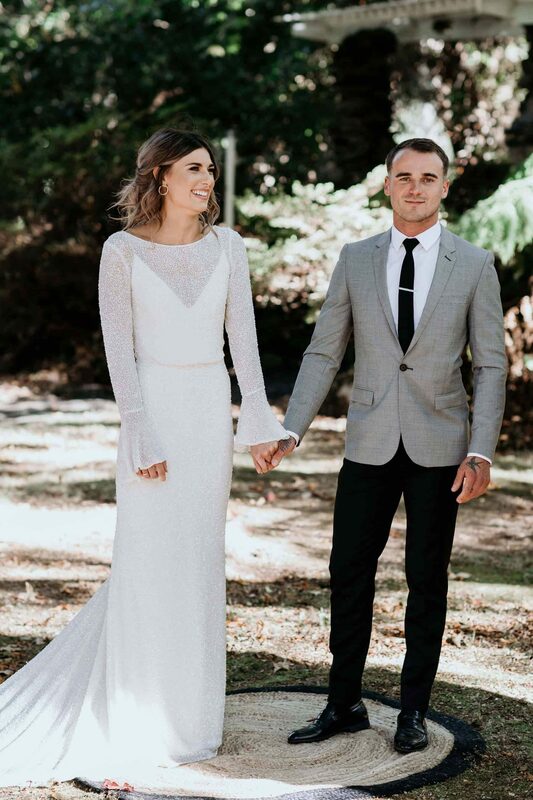 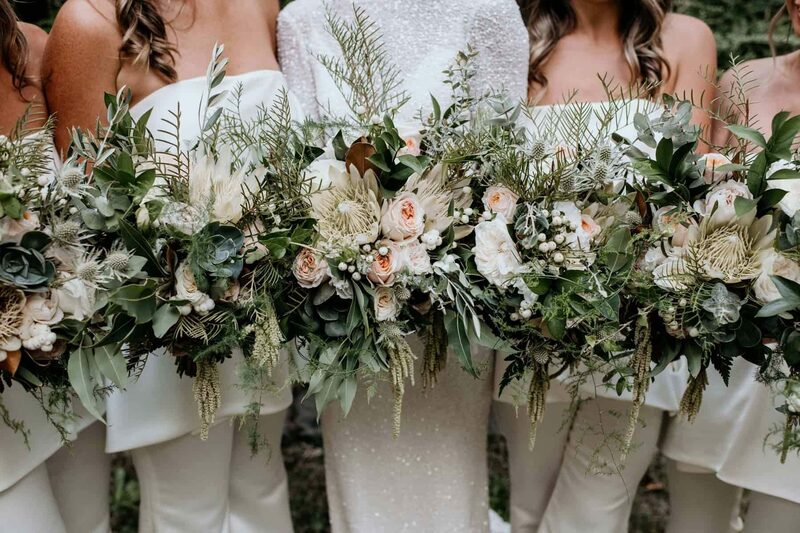 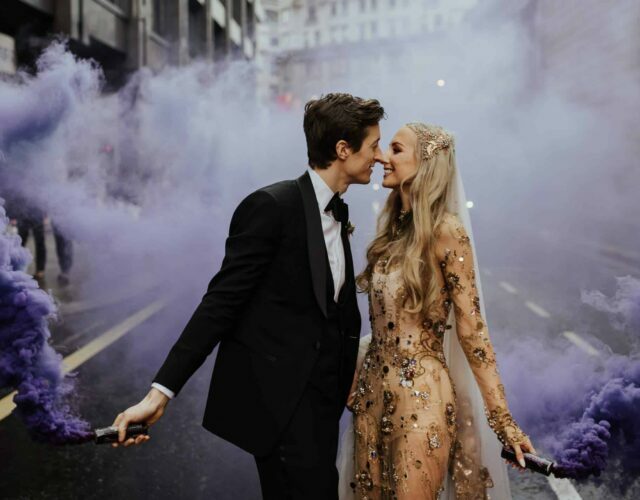 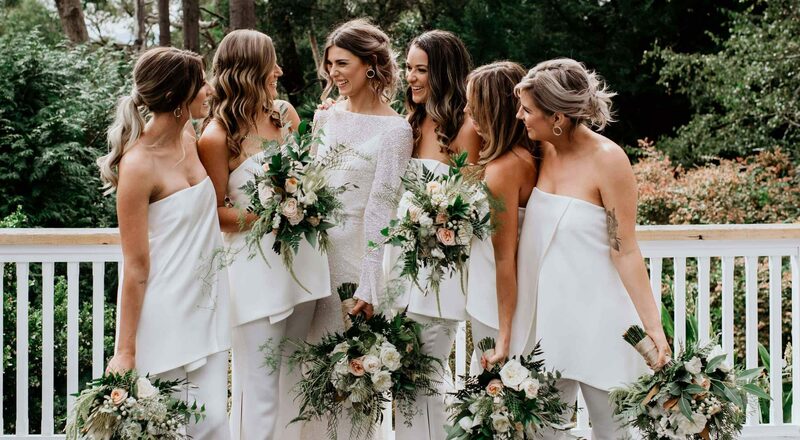 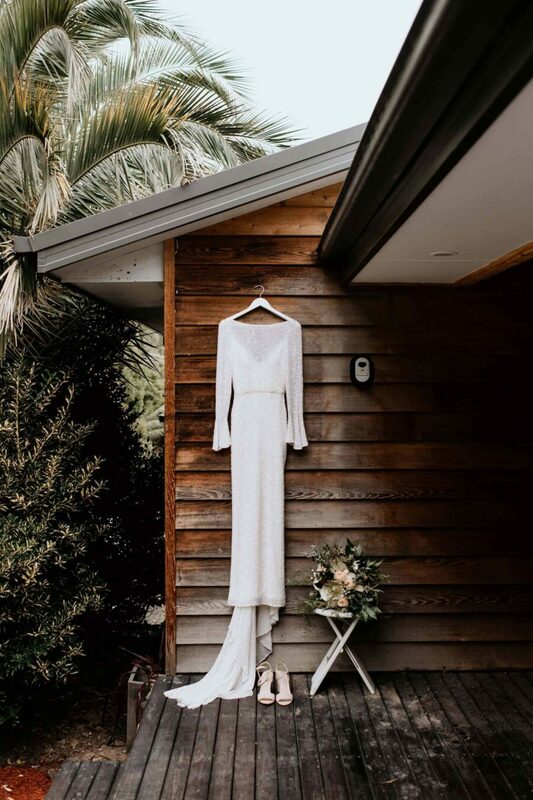 Rach wore and incredible bell-sleeve sequin wedding dress by Kara Jade Designs, while her bridesmaids wore chic jumpsuits in white. 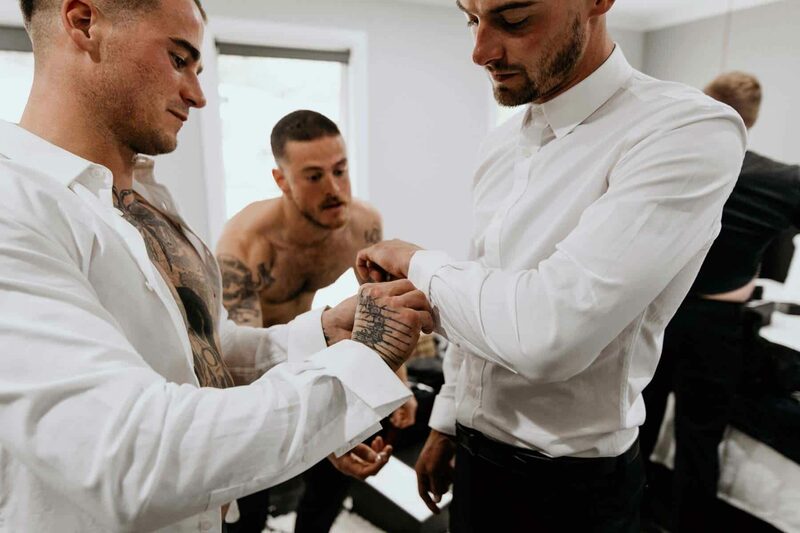 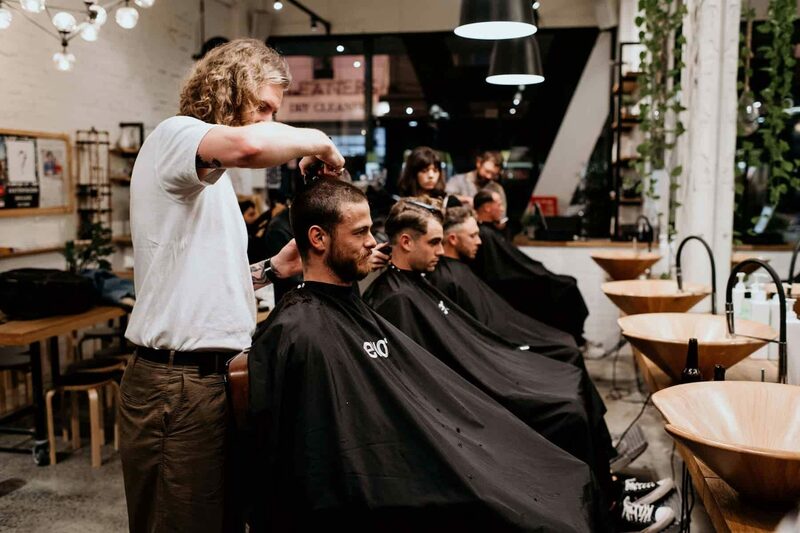 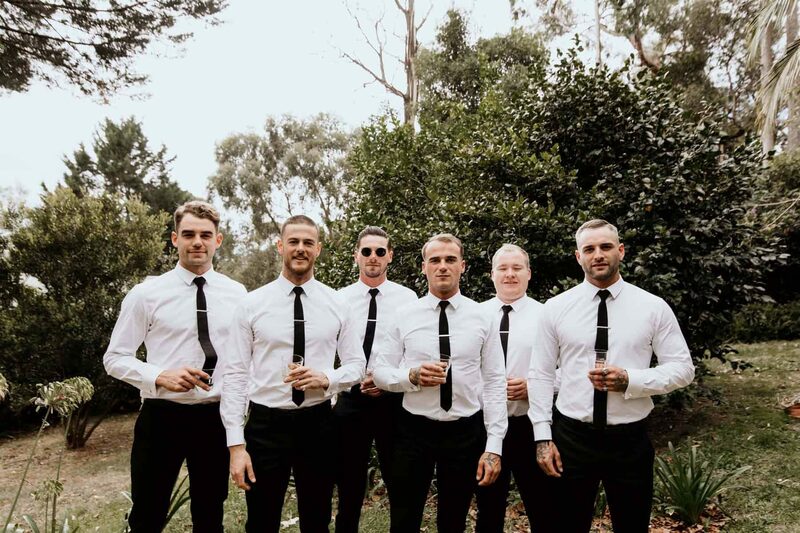 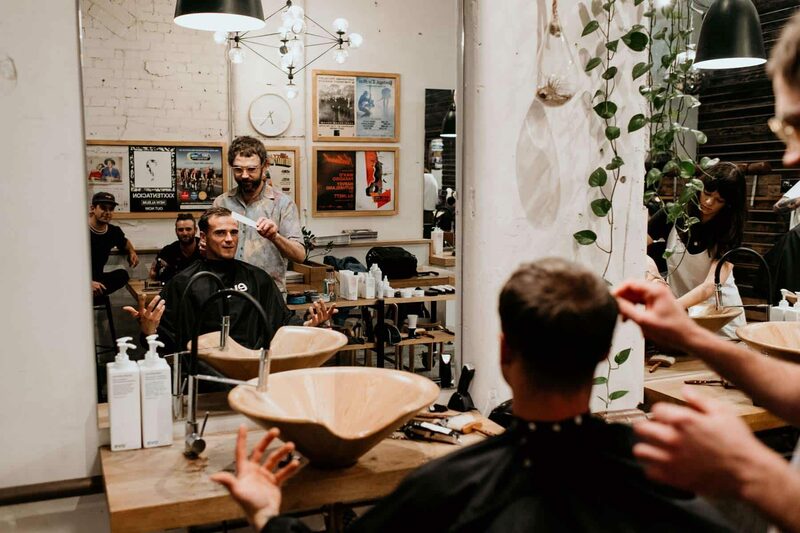 Jesse and his boys hit the barbers (and the beers) to get wedding-ready at The Bearded Man, and the generous groom gifted his crew Gucci loafers to wear with their Jack London suits. 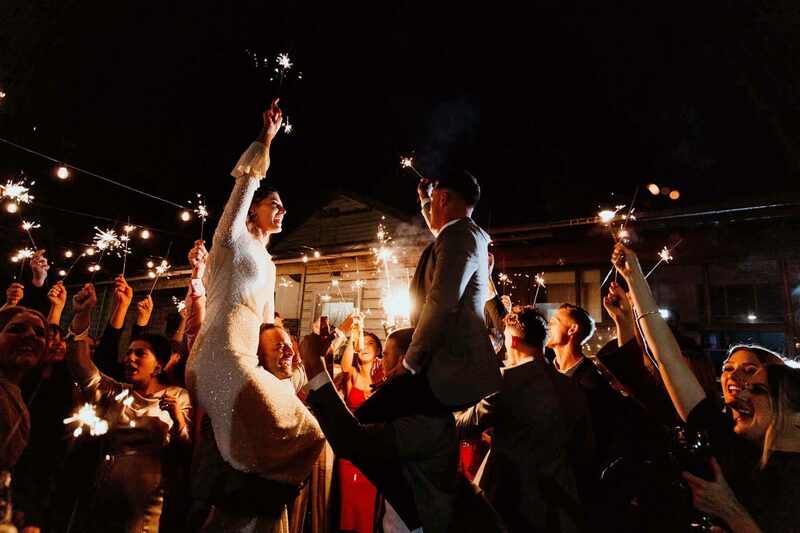 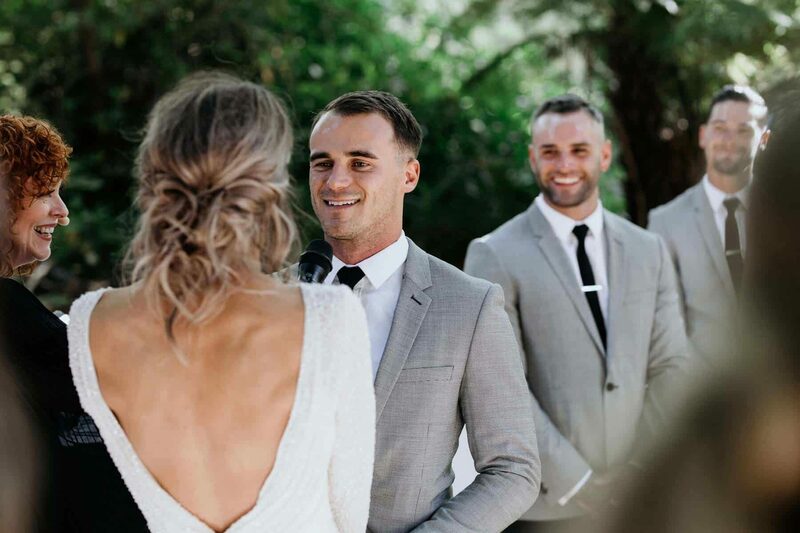 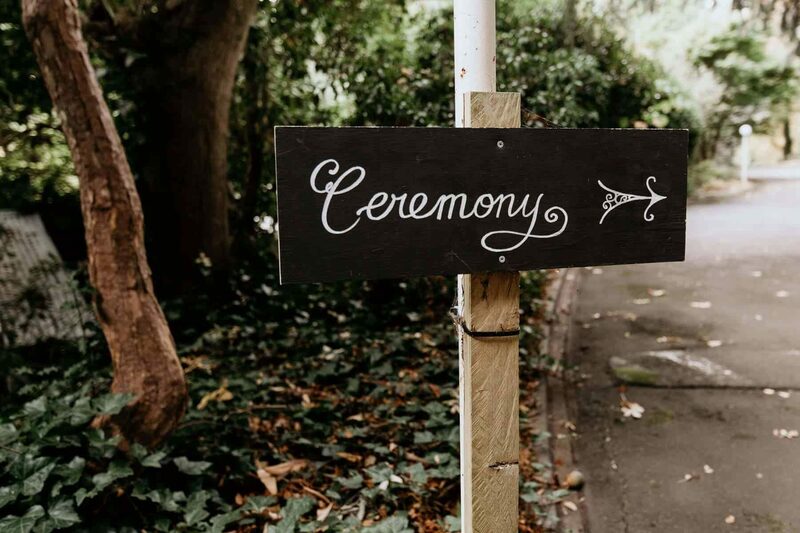 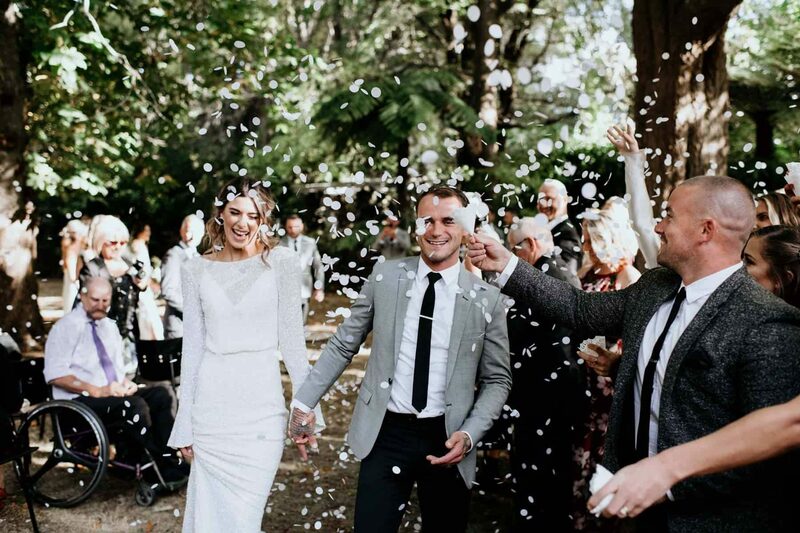 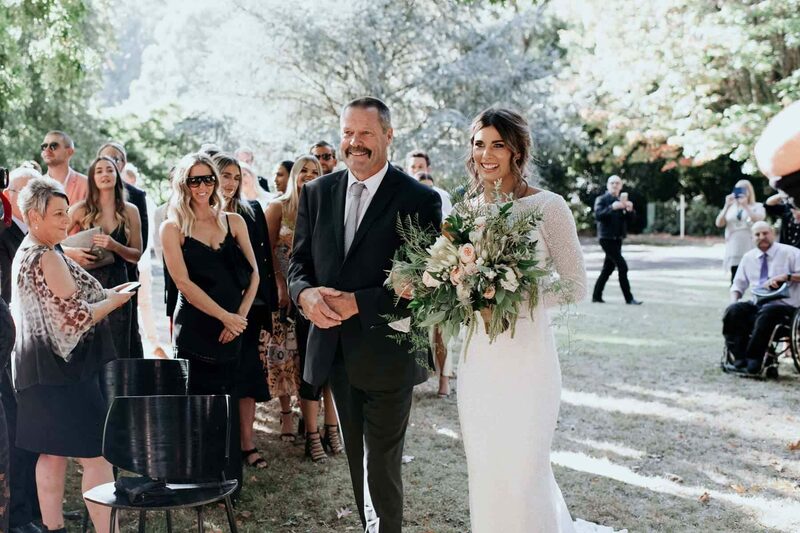 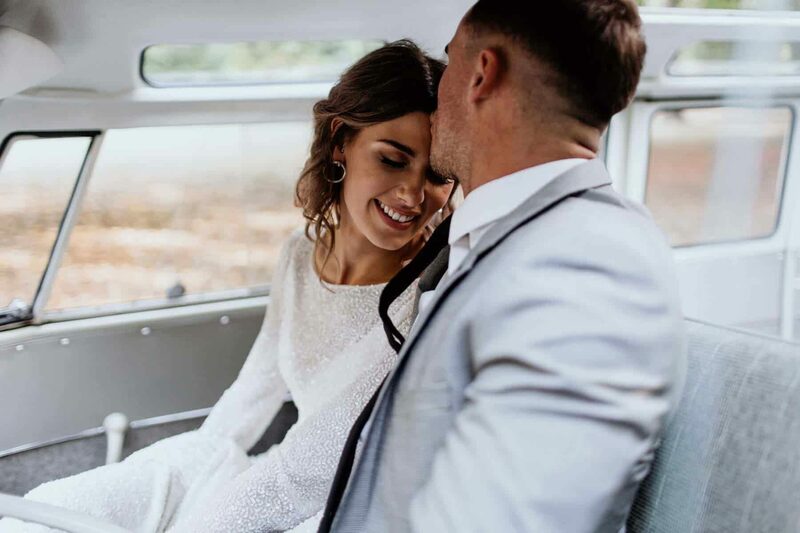 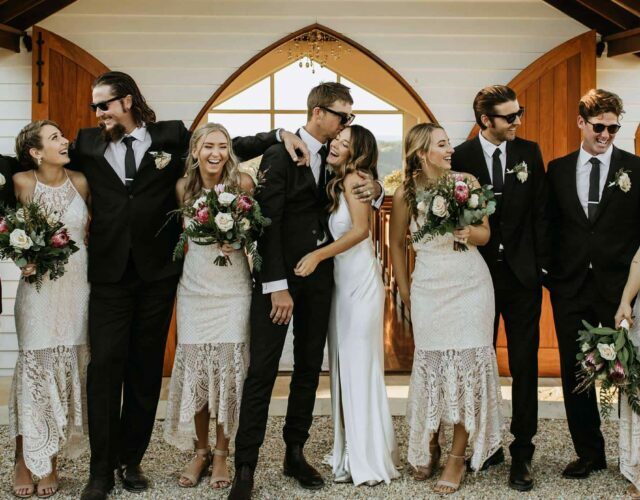 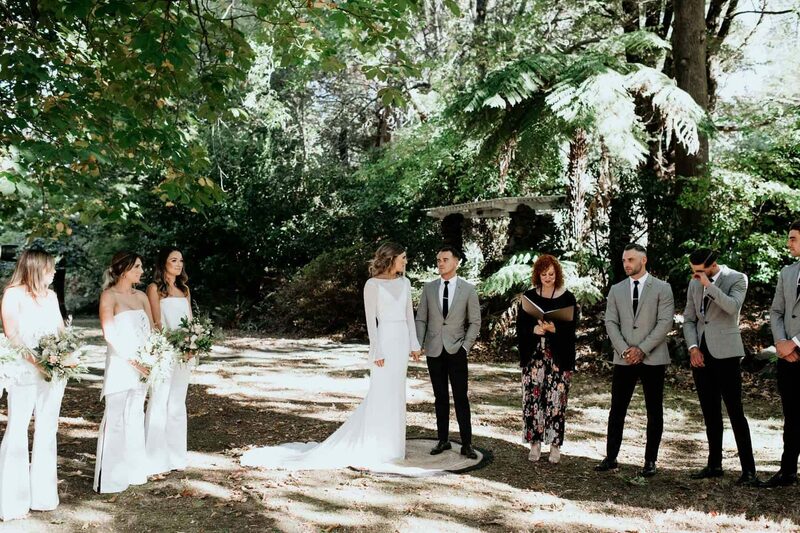 Officiated by a family friend, Rach tells us the ceremony was “the perfect balance of love, laughter and tears.” After the I do’s, the newlyweds lit a candle and popped a bottle of Champagne in memory of Jesse’s mum, who sadly passed a few years ago. 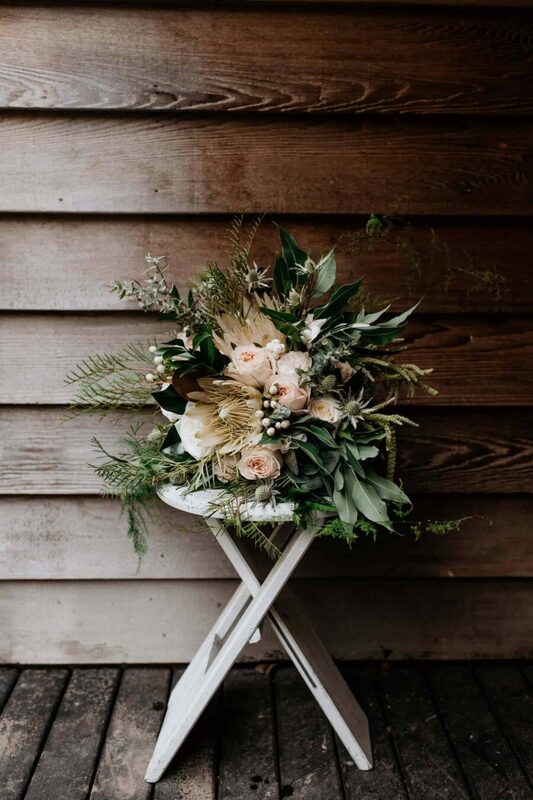 We’re loving Rach’s classic bridal bouquet with just the right amount of wild. 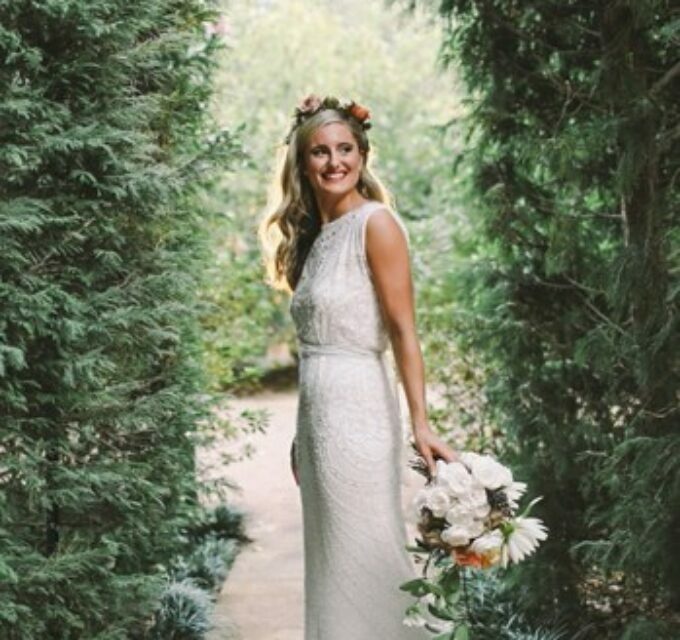 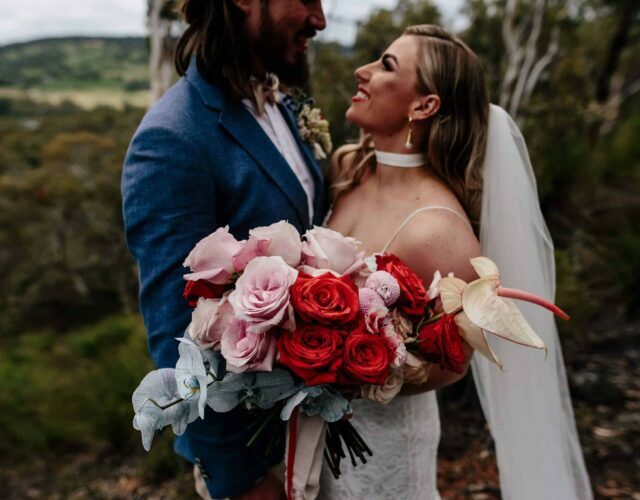 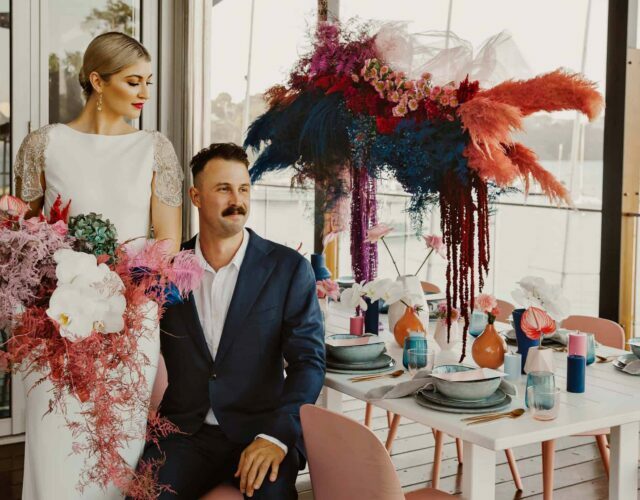 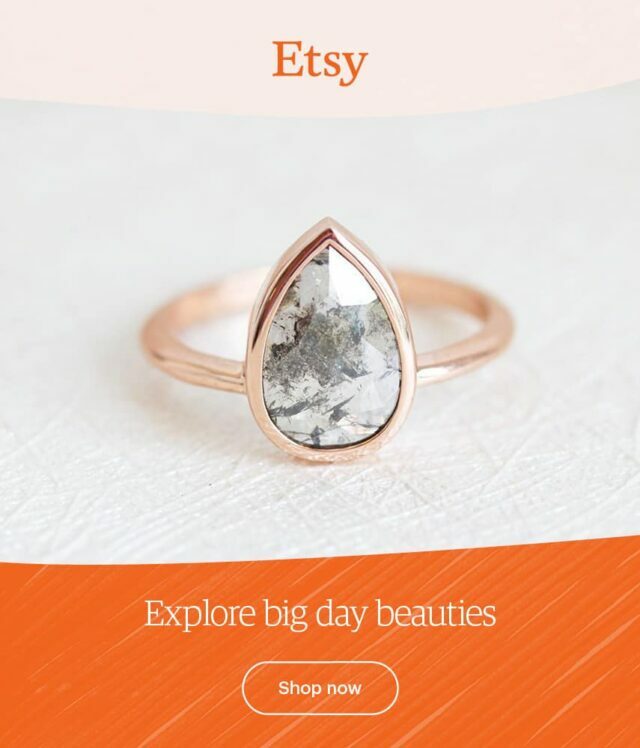 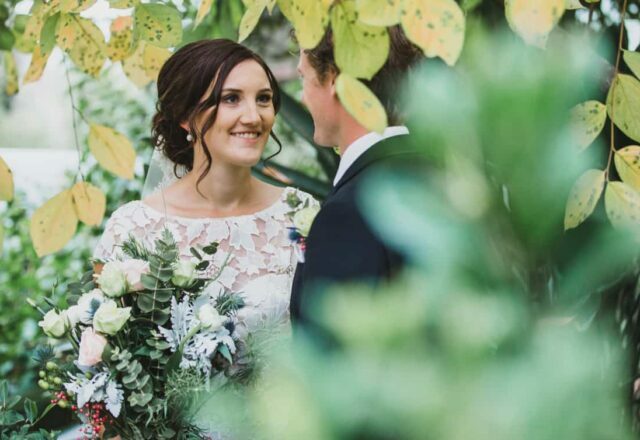 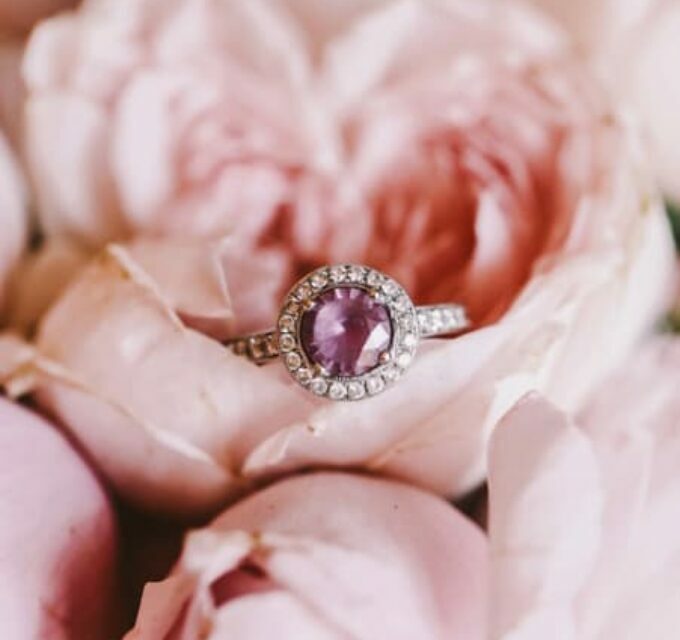 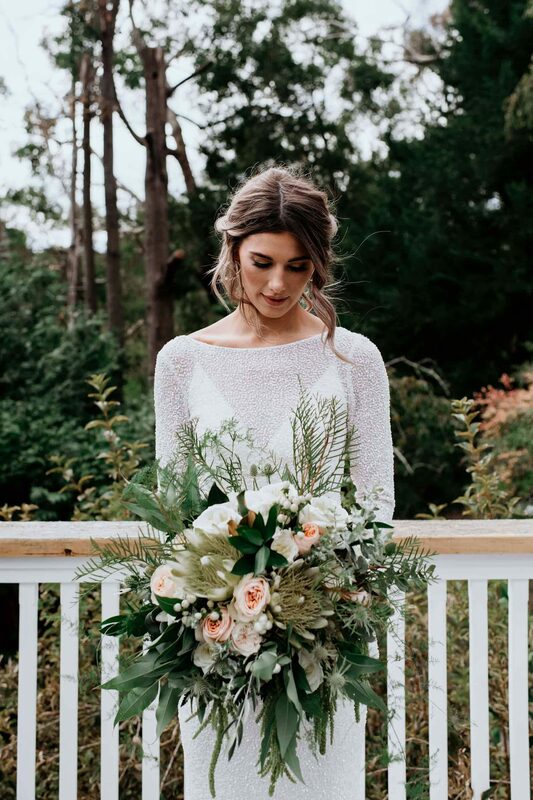 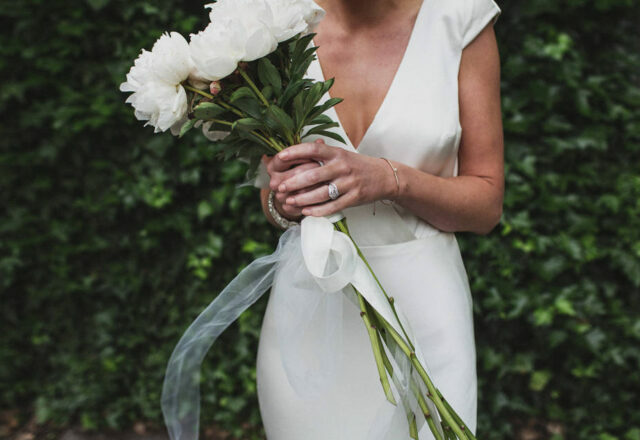 Rach was equally in love and tells us her florist, Dayne from Pinky Promise, was a pleasure to work with. 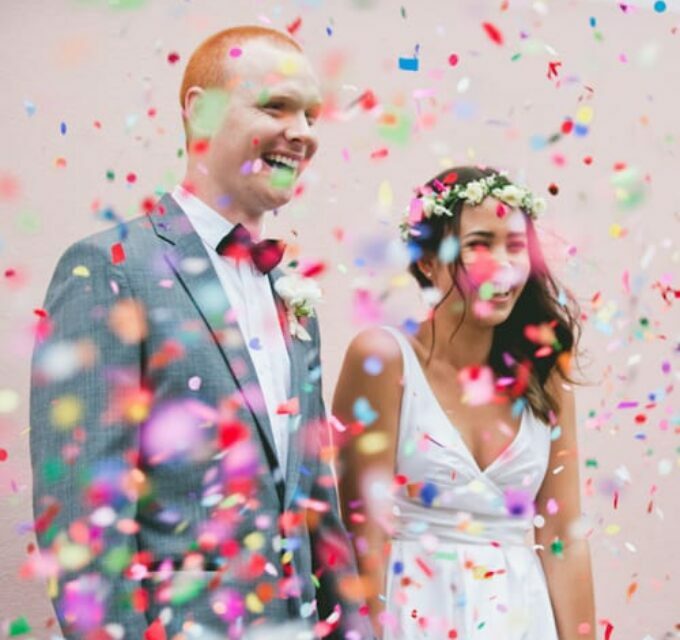 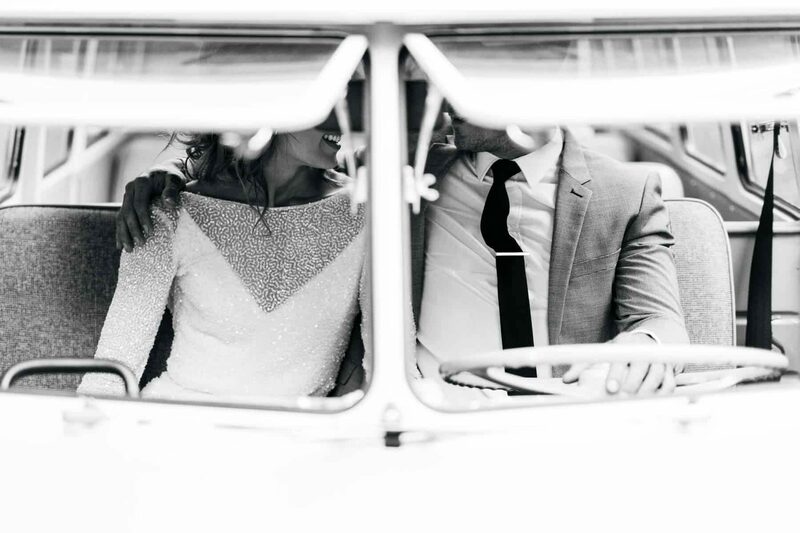 Daniel Chafer’s candid photography style was a perfect fit for these camera-shy lovebirds. 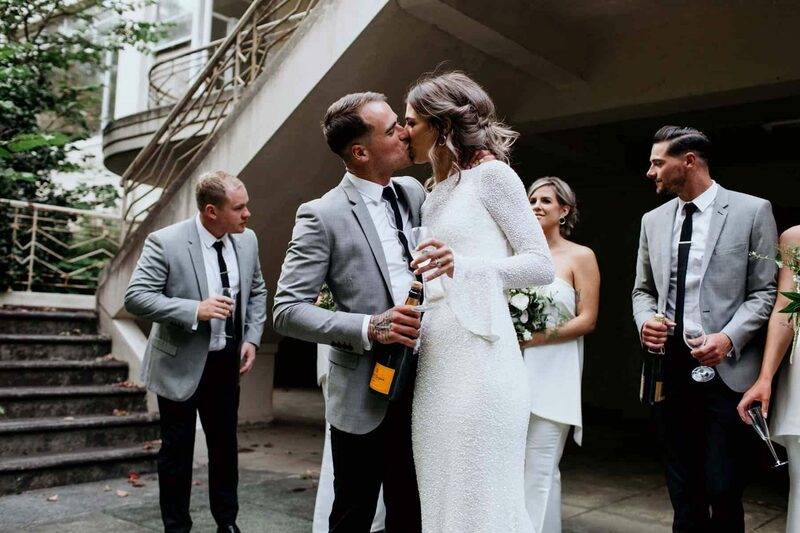 Each tells us “even though we had never met Dan, it felt like he was a close friend there to capture our special moments. 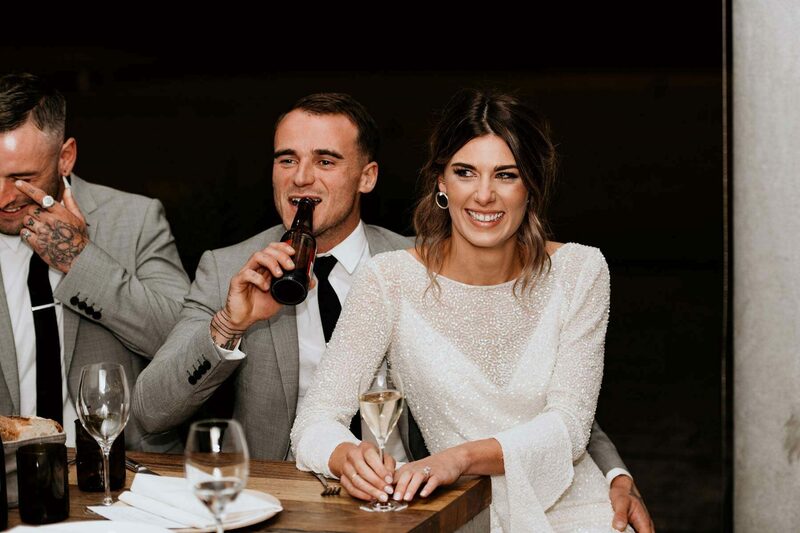 Dan was laid back and seemed to just fit in with the day. 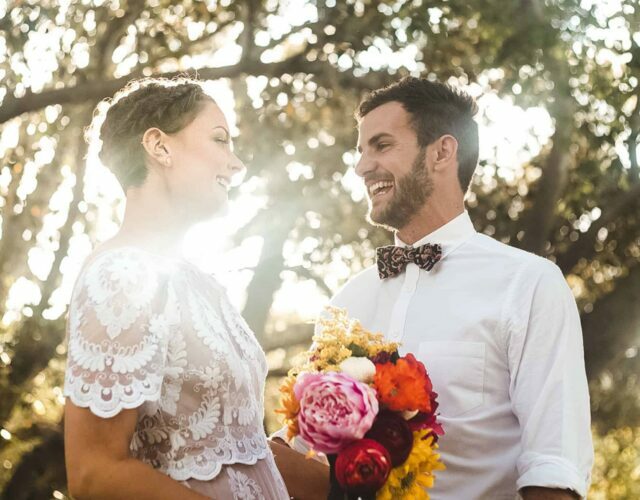 He and our videographer (La Luce Films) made the perfect team!